Internationally renowned designers Maggie and her husband opened here in 1985, dressing generations of women in comfortable, contemporary luxurious styling. You will find sumptuous fabrics, individual, colourful, textured. 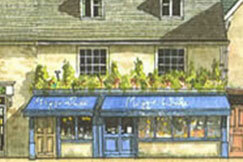 And the eclectic jewellery is a shop within a shop. Stockist of beautiful Italian leather handbags at amazing prices in a wonderful range of colours and designs, all perfectly complemented with an array of gorgeous accessories including fabulous scarves and some delightful fashion jewellery. 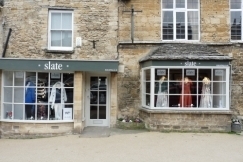 Slate Clothing is an independent womenswear boutique based in the heart of Burford. We offer the very best in hand-picked ladies' fashions for every occasion. We source our clothes from within the UK and Europe and are passionate about style, individuality and providing the ultimate shopping experience. We are open 7 days a week.